New: Template designer, enabling users to create templates that can be used to export customized 3D PDF files. New: 64-bit support to handle very large and complex models. New: Embedding in HTML, user can include the generated 3D PDF in automatically create HTML to make it easy to share 3D PDF files in the web. New: Merging multiple PDF files, the plug-in includes a new tool for merging multiple PDF files. Users can use the merge feature to merge a company’s front page—in PDF format—with a 3D PDF model. New: Floating license support, ready to support teams of Rhino designers. New: Command line integration, GUI free mode to enable scripting the process of 3D PDF creation inside Rhino. New: Open After Export, the ‘Open file after export’ option, makes it easier for the user to view the generated 3D PDF file without searching for it. Enhanced: Better 3D PDF illustration mode, with the new illustration viewing mode, share your models in a new better look, showing details like never before. Enhanced: Better control over the generated 3D PDF file size. 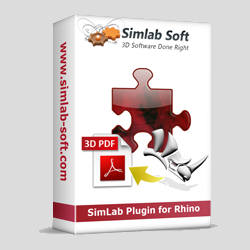 By utilizing Rhino’s Render Mesh, the user has control over the size of the generated 3D PDF file.